fruit and veg continues… My success rate to date leads me to believe that even if I had a large enough plot I certainly would not be self-sufficient by any stretch of the imagination! My Zucchini are trying to escape! My zucchini are still desperately clinging to life as the problem of white mold on the leaves and rotting ends on the fruit continues. Apparently I have blossom end rot! Fellow blogger Enjoy Creating suggested I try Hydrogen Peroxide and kindly gave me a link to Using Hydrogen Peroxide in the Garden so fingers crossed this may provide the answer! I have now removed all the leaves which were covered in the white mold and sprayed the remaining leaves and baby zucchini with the diluted Hydrogen Peroxide solution. I used 2 tbsp to 1 litre of water. For those looking to buy this product in Portugal it is called Agua Oxigenada and is available in both Continente and Intermarche at under 50cents for a 500ml bottle! 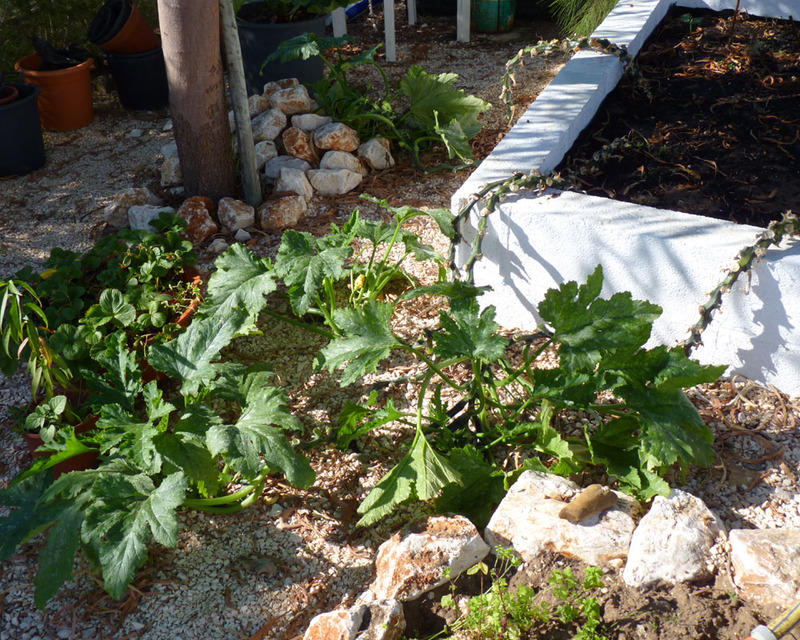 The stalks on my zucchini are now over five foot long and still bearing fruit despite the fact the plants are now almost bald. Do they look like they are trying to escape? I do hope the Hydrogen Peroxide is the magical elixir of life my poor zucchini have been waiting for! Think positive Piglet – next month they will grow to the size of marrows! 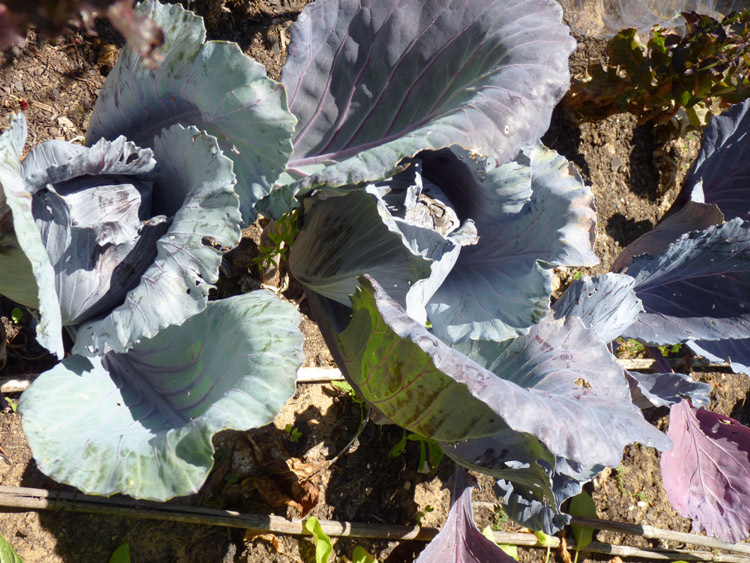 Who will win the battle to eat the Red Cabbage - Me or the Bugs? It’s a a constant battle with the bugs as to who will have the privilege of finally eating my Red Cabbage. I spray regularly with diluted washing up liquid to deter the little critters, but they are persistent to say the least! Spring onions, sorrel, cherry tomatoes, chilli/jalapeno peppers, orange peppers and melons are growing well – at the moment. The honeydew melon seedlings are a result of just scattering some seeds from a melon I had bought for lunch from the local market. Much to my amazement they are still alive and growing well. My last few Strawberries were delicious! 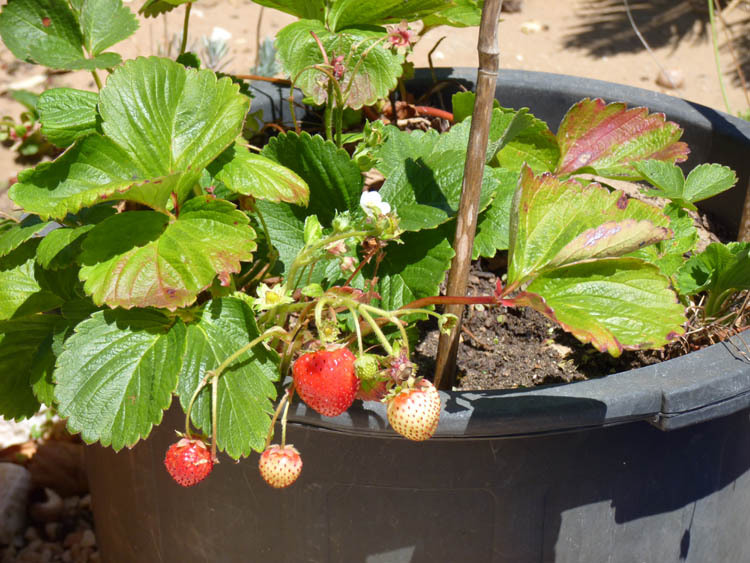 My Strawberry plants continue to bear fruit, and much to my surprise, dare I say, are still healthy and even producing runners for further plants! A "Rhubarb Crumble" will soon be on the menu! 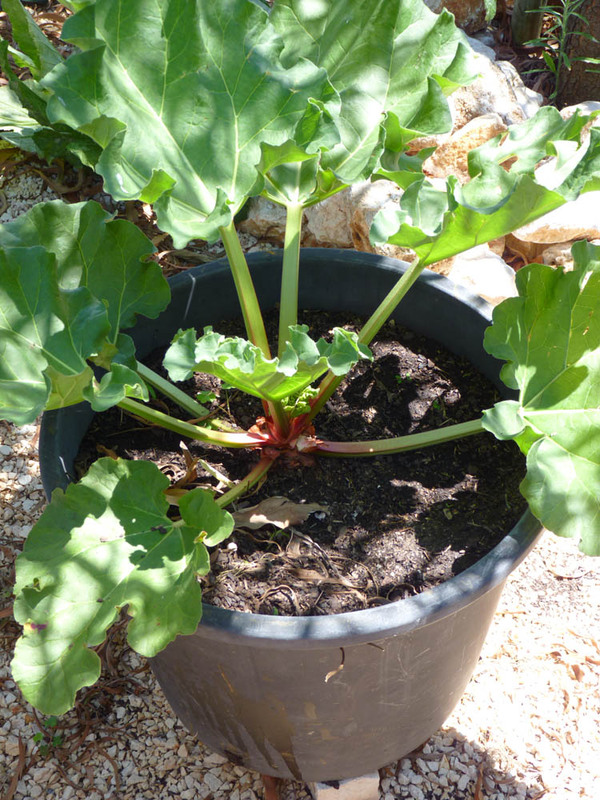 My solitary Rhubarb plant, kindly donated by a friend who had grown several from seed last summer, is finally producing some usable stalks and it won’t be long before we have our first Rhubarb Crumble desert since moving to Portugal. However, I suspect I will have to transplant to the ground this coming winter. Apparently, they do not grow well in pots on a long-term basis. Does anyone have any experience of growing Rhubarb in pots long-term? The Cape Goosberries plants are the latest victims to join my “fruit and vegetables in pots” collection. I have never tried to grow these before so I was absolutely delighted when I was given three plants to experiment with! Does anyone have any tips on growing Cape Gooseberries please? I want to at least give them a fighting chance! Tomatoes – Pot grown tomatoes have grown VERY slowly this year – I have about three tomatoes on each plant so my aspirations as to having a “glut” of tomatoes which I could sun-dry have been dashed. Hey ho there is always next year! Chillies My Chillies grown in pots continue to grow well! These seem to grow all year round. Yes, this is my lettuce! The lettuce has now run to seed; I will now collect the seed and grow more. 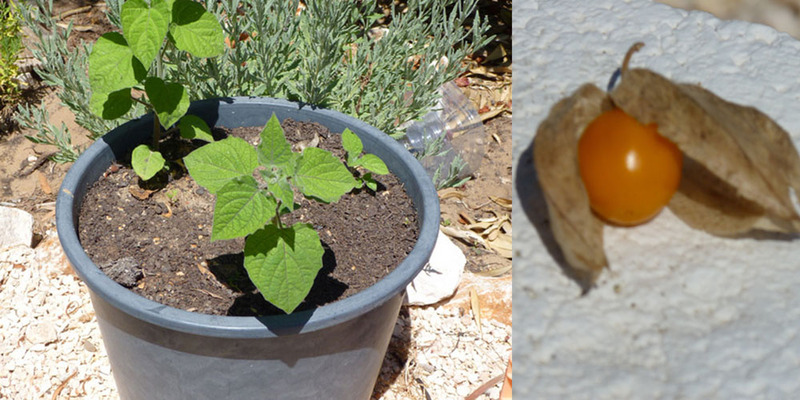 I don’t know why I have never thought of this before, so like growing the Cape Gooseberry, another first! Garlic – While I was in France all the leaves died off; I am just plucking up the courage to investigate further to see if I have any heads of garlic lurking in the soil beneath! Keep the Cape Gooseberries in the pot Piglet. They were growing in our garden in Lagos when we moved in and they took forever to stamp out as they grow like crazy and take over the garden (which is why we removed them – the gooseberries were fine but it’s nice to have other plants as well!). Thanks for the tip – I will take your advice. However, I can’t even get mint to grow! That’s the prettiest lettuce bolt I’ve ever seen! I love that you tried so many different things in the space available. You’ll trade in your red thumb for a green thumb next year for sure! Yes, the lettuce are really pretty. I’ve never let them go to seed before. I think your zucchini are looking really good. Blossom end rot is a problem and I think it’d be like it is for tomatoes and needing calcium, if you can’t find something like tums, you may think about trying ‘powdered instant milk’, I’ve also heard crushed egg shells are good source of calcium for plants. I think you’re doing an awesome job at growing your own produce. I figure over time, you may very well be mostly self sufficient. I really enjoyed your update and seeing your garden flourishing. I forgot to thank you for the link and mentions. I really appreciate it. You made my day! You’re a peach, my friend. Hey no probs. Your gardening posts are a great inspiration! I can’t understand it. I used all fresh bagged compost and manure for my Veg patch. I will ahve to check the nutrients liststed on the bag. I wonder what the word for calcium is in Portuguese. Probably the same. I keep plodding along; one day I WILL crack it! I’ve had vegetable gardens in Connecticut and have run into many of the same problems…but I’ll bet each tomato will be savoured and enjoyed, even if you only have a few. Soil, I only built the raised flower beds this year and filled with all compost and manure. Perhaps the compost I bought was deficient in some minerals. You are growing a great variety of different things PiP. You are learning more as you go along and I think you are having good success stories more than bad ones. Hopefully, the hydrogen peroxide will work for the zucchini – I’ll be interested to know the result, and blossom end rot seems to be a common problem with them. I am also reviewing my soil now as well and see if I can buy a calcium supplement as suggested. Nice variety! In our garden we love planting stuff in the hope we can one day watch them wither and die, or get eaten by the birds! Strangely my chilli plant thrives all year round! I’m sure we tried garlic but I think something ate it! Oh and potatoes. For the last 3 years we’ve tried the old tater and even though we have masses of leaves the little white spuds are barely larger than a ping pong ball. Sigh. Tasty though! your experiences sound similar to mine, but we stay positive and live in hope! This is the part of gardening I don’t like and why I gave up on roses – fighting the pests, mold and disease. A real pain. Hang in there. Some people manage to do it. I don’t think I pay enough attention to bugs and things until it’s too late. I know what you mean about Roses. I have not even attempted to grow any here in Portugal. a nice assortment indeed! I love rhubarb… 🙂 that lettuce is gorgeous..does it taste as good as it looks? what kind is it? Hi Soapbird -what lettuce? LOL, it has run to seed. It was Rosso which is a redish lettuce. Looking forward to the Rhubarb crumble. From just looking at your photographs I would suggest that your soil is very poor. It needs more organic matter – compost, chicken manure. Get the soil right and all will follow. The soil is all compost and rotted manue. I only filled the raised bed this year. Perhaps there is some nutrient missing? It’s meant to be compost for vegetables…who knows it’s all in Portuguese – this is where I become so frustrated! I totally admire you PiP for all the effort you have made to grow your own stuff – well done you! So what if some of it wasn’t perfect, you’ve had fun along the way and probably learned a lot and picked up a lot of tips. I’ve had my own disasters too and successes also, so never give up – I’m patting you on the back here….keep going…. I could have done with you this afternoon when I dug up my garlic – still that’s another story! You did a great job considering the challenges… I had a bunch of plants meet Nirvana form whit mold. If your tip works, I’ll try next year. 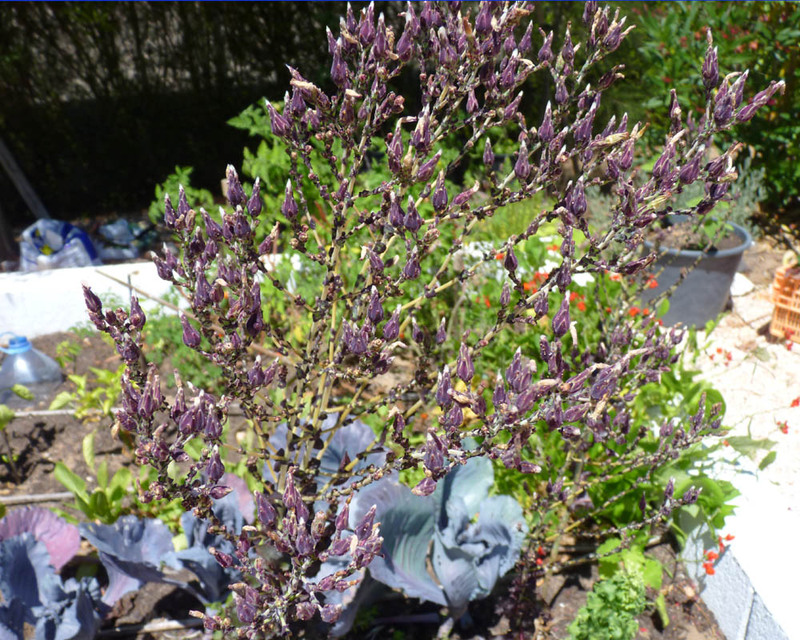 Your lettuce has purple flowers? Cool! Hey 737 – I hope the Tip works. the Lettuce was a Rosso – the purple things are cabbages! Good luck with the 1000 emails – you will need another retreat to relax! Unfortunately, I never could up on all the comments while I was away…I just had to move forward. Urgh! That was meant to read … meet Nirvana from white mold.